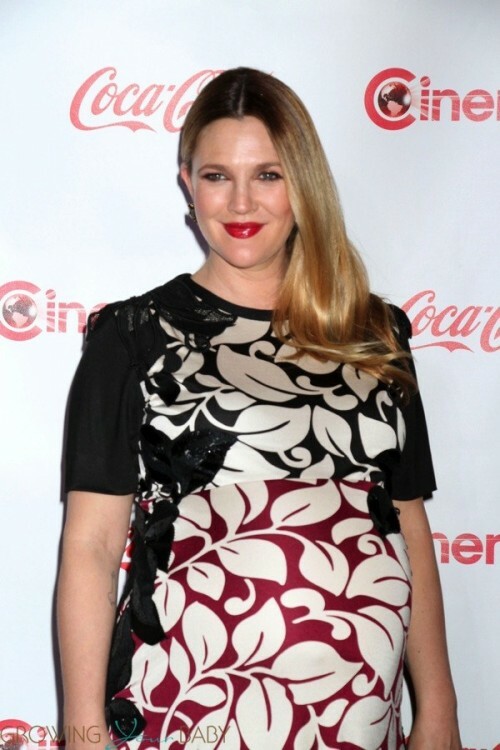 It won’t be long now until Drew Barrymore and husband Will Kopelman are able to meet their baby girl. The actress showed off her blossoming belly in a bright yellow Ludwig Boutique vintage dress while on the red carpet for Warner Bros Picture’s Event at CinemaCon 2014 in Las Vegas. Drew was joined on the red carpet by Adam Sandler and Frank Coraci. In between posing for photos the director was photographed checking to see if he could feel the baby move. The three-time on screen duo was honored at CinemaCon with the Male and Female Star of the Year awards. Later Drew did a quick change, showing off her growing belly in a floor-length Marc Jacobs dress with a floral print and beaded accents. During this pregnancy Drew has been very open about her love for food. We agree! Keeping the baby nourished is her #1 job.